Think shipping containers are strictly for moving cargo? Think again. Shipping containers are being used in a variety of unexpected ways—emergency shelters, pools, medical clinics, office and retail buildings, hotels, and pop-up restaurants. It doesn’t stop there, either. Now all kinds of housing are being constructed from shipping containers because they offer ready-made steel modules that can be quickly modified into energy efficient residences. An early example of shipping container housing appeared in Armenia after an earthquake in 1998. In Redondo Beach, CA, eight containers were used to build a two-story house, completed in 2007. This two story house was built in an eco-friendly, contemporary style, using a combination of stick-frame construction and shipping containers. The house was built with LED lights, Energy Star appliances and insulating paint developed by NASA. When the house was constructed, building costs were $250 per square foot. The Redondo Beach house building costs were about $135 per square foot. In 2017, a 2-story apartment complex for the homeless made entirely out of shipping containers opened in Orange County, CA. Each 480 square foot apartment consists of three shipping containers, with a kitchen, bathroom and combined bedroom/eating area. Two walls are floor to ceiling windows, bringing in natural light. The innovative project was completed in less than five months. A variety of builders and architects have begun to specialize in shipping container houses, such as SG Blocks, Backcountry Containers, Cargotecture, Three Squared, and Sundog Structures. The costs of a used shipping container range from $50,000-$75,000 for 320-400 square feet. Units that are 160 square feet run to $20,000 to $35,000. 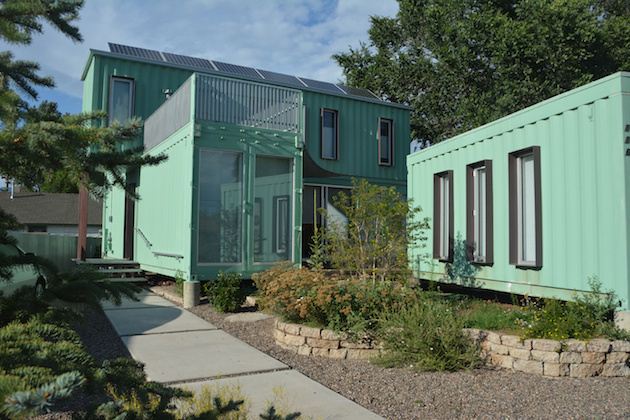 Have you seen shipping container housing in your community?